weekly column for the Gilford Steamer. A recent article is shown below. 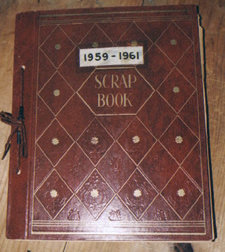 2-24-05 "T-AHS’s Scrap Books Reflect Gilford’s History"
The Historic Highlights item in the February 17th issue of the Steamer included reference to how T-AHS Board Member Lloyd Ekholm randomly selects one of T-AHS's Scrap Books to read whenever he has an opportunity to do so. Well, in truth, Lloyd is not the only person enthralled by these precious books that have been created during the past sixty-plus years. I n fact, there has been an even greater temptation recently to pause and browse. This temptation was created when Diane Mitton, T-AHS's collection manager, has been working in Grange Hall to catalog these books as part of the Society's archival records. To help paint the picture, upstairs in Grange Hall there are four long sawhorse-supported tables that once were used for Grange suppers. Now committee members gather around these vintage tables to meet. These tables offer an ideal surface on which to spread out the numerous scrap books as Diane works with them. And, of course, whenever anyone comes into the room, the display of all these vintage scrap books is enough to entice the person to sit down and start browsing. So, of course, the Steamer is an opportunity to share with you some items that can be found in these precious old scrap books. A couple clippings that appeared in March, 1976 issues of the Laconia Evening Citizen caught my eye. It seems that Harry Graves was then writing a Thompson-Ames Historical Society column called Gilford Historical Nuggets. Let's share some nuggets of Gilford history that Harry Graves chose to write about 29 years ago. "In 1840 silk was produced by Benjamin Rowe on his Gunstock Valley Farm, from mulberry trees he planted and silk worms he imported. "The first house on Dockham Shore was moved from Glendale across the ice by 20 yoke of oxen. "The granite slab with the hole in it which adorns the lawn of the late Frank Varney's house on Morrill St., was the top to the well in his kitchen floor before he remodeled the kitchen. "The hotel on Diamond Island was move across the ice to the Weirs. "The first outboard motor was made in Lakeport by McDuff Marine Engine Co. for use in propelling log rafts from the islands to shore saw mills. "The longest rope ski tow in the USA, 1.5 miles long, was located on the West side of Gunstock in 1927. It was abandoned because of unbearable strain on the skiers' arms." "In 1825 there was a dam across Route 11-B about one-quarter way between Routes 11-A and 11, creating a millpond for a sawmill operated by Joseph Potter. "The brick used in the VanEtten House in the village was made in a kiln on the building site. This building has also been a glassworks, blacksmith shop and a school. "A blacksmith shop once stood where the town hall now is. "Glendale was once known as Hennessey's Landing, due to Hannessey's store being there. "In 1897 workmen building Kimball's Castle were housed on the old Lady of the Lake while it was beached at Glendale, condemned and awaiting scuttlling. "In 1840 Governors Island was known as Davisville, being owned by Eleazer Davis whose son Natt developed a community at the bridge consisting of two dozen residences, a blacksmith shop, church, school, and a cooperage." Each of these nuggets of history causes us to pause and ponder the past. Each nugget is like a piece of a jigsaw puzzle, a piece of Gilford's history. We can imagine old timers -- resting near a wood stove, or pausing while playing a game of checkers, or chatting while at a quilting bee - talking at length about any one of these nuggets. How much more they knew of the details of these historic nuggets! And then we recall the many oral histories that are part of Gilford's archives. Certainly some of these nuggets have been expanded upon as we try to preserve and celebrate Gilford's cultural history. We also realize how important T-AHS's mission is and, even though much has already been done, how much more there is yet to do. Thompson-Ames Historical Society welcomes those who wish to become members and those who wish to offer their volunteer efforts. Committees are already hard at work preparing for another full year. Won't you join us? To learn more about T-AHS, visit our website www.gilfordhistoricalsociety.org or call 527-9009 to express your interest - or just drop in to visit whenever the OPEN flag is flying at the Grange building's doorway to The Hallway of Historic Gilford Signs.